Just back from our annual vacation and we enjoyed ourselves as much as always in our special mountain hide-away. It was a remarkable and unusual holiday this year as you can see in the above photo of my darling daughter Emma Rose sitting beside Gold Lake. Normally we swim in this lake but this season the lake is still full of ice and the surrounding mountains are snow-covered. Because of the heavy snowfall this winter and the late spring storms this area of the high Sierra where we vacation is only this past few weeks beginning to melt. Here we are in the last week of June and the nearby lodge is still unaccessable and our favorite Alpine meadow where we love to walk is under several feet of snow. But it was magnificent with the rivers and creeks cascading with record levels of water and the many waterfalls were awe-inspiring. We were still able to do many of the hikes we enjoy and the meadows were resplendent with wildflowers and the mountain air was especially invigorating. The area is known as Lakes Basin and is overlooked by the stunning Sierra Buttes. About 50 miles north of Lake Tahoe I highly recommend the area for those that enjoy the natural beauty of the Sierra Nevada mountain range. A combination of sacred and secular music -- including covers of songs by Earth, Wind & Fire, Maxwell, Al Green, Michael Jackson and Lynyrd Skynyrd -- will appear on the self-titled debut album from the Alabama a capella group Committed, winner of the second season of NBC's "The Sing-Off." "We wanted to be true to who we are," the group's Therry Thomas tells Billboard.com. "We're singers who love a cappella music and singers who happen to be Christian. Christian music is inspirational. It's love music. We wanted to have an album with real-life music. Christians go through breakups and love and all that stuff. We just wanted it to be real, and to not offend anybody." "Committed," due out Aug. 30, will include the sextet's rendition of Michael Jackson's "Hold My Hand" that it performed during "The Sing-Off." Other covers include Al Green's "Let's Stay Together," Maxwell's "Pretty Wings," Earth, Wind & Fire's "September" and "a new spin" on Lynyrd Skynyrd's "Sweet Home Alabama." "We're just trying to pay homage to our home state," Thomas says. "We've been living in Huntsville the last six years, so we also wanted to pay tribute to our supporters from there. It was a lot of fun. It's a nice new spin to an old song." 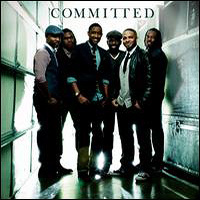 Committed has already started a summer tour to advance "Committed's" release. "We're going to be building our fan base and perfecting our show," says the group's Dennis "DJ" Baptiste. "Then once August comes and the album is out, we're just gonna promote, promote, promote everywhere." The schedule includes performances July 1-2 at the 17th Annual Essence Music Festival in New Orleans and a return to "The Sing-Off" when its third season gets under way on Sept. 19. "Before 'The Sing-Off' we were just normal people," Thomas says with a laugh, "just into singing around, singing in choirs and stuff like that. But since the show, people recognize us randomly in Wal-Mart and the airport. People ask for autographs...A lot has changed." Adds Baptiste, "It's crazy to be looked at like that now. To me I'm the same person I was before 'The Sing-Off;' all we did was go sing on a TV show, and now all of a sudden people are going crazy and crying when they come to see us. That love and support from fans is probably the most surprising thing to me." Read more. When she was growing up in San Anselmo with a girlhood dream of becoming a pop star, Lily Elise papered the walls of her bedroom with pictures of her idol, Christina Aguilera. So when the 20-year-old former Sir Francis Drake High School cheerleader got to sing "Lady Marmalade" with Aguilera on this season's debut of the NBC-TV reality talent competition "The Voice," she was ecstatic. "I listened to all Christina's music and aspired to be just like her when I was little," Elise said this week from her parents' home, sounding upbeat despite being eliminated from the show on Tuesday night. "Actually singing on stage with her was a childhood dream come true for me." In Marin, her family and friends have been abuzz with excitement, pulling for her as she advanced through the weeks of competition. And she had a lot of support from young people hoping to emulate her just as she modeled herself on Aguilera. For four years, until she graduated from Drake High in 2009, Elise was a member of Til Dawn, a teen a cappella singing group sponsored by Marin's Youth in Arts. The ensemble performed widely in Marin and the Bay Area, opening for such name groups as the House Jacks and Boyz II Men. The 15 teens currently in the group cheered on their suddenly successful alumna, and were recently filmed excitedly watching the show together by a news camera crew from the local NBC TV affiliate. "There's been an added buzz in the air among these young folks," said Miko Lee, director of Youth in Arts. "To see Lily adopted by her own idol, Christina Aguilera, was very exciting for them. They learned from Lily that you can go on to have amazing success." Read more. Til Dawn has been singing within our community for years (including at my kids' school) and it great to see that the skills learnt while singing in a community a cappella group can lead to all kinds of opportunity. About 200 people attended the first day of the 32nd annual National Sacred Harp Singing Convention at First Christian Church on Valleydale Road today, keeping alive a tradition that dates back centuries. They sang from the Sacred Harp Songbook, first published in 1844 and revised four times since. "When I sing I'm carrying on a tradition of great-grandfathers," said Mark Davis of Pearl, Miss., chairman of the convention. Throughout the 1800s, the hauntingly harmonious sounds of sacred harp a capella singing echoed in churches throughout the South. That style was kept alive in rural churches, especially by Primitive Baptists, who never adopted instruments. It's called shape-note singing because the hymnal uses shape notes, noteheads in the shapes of open and solid squares, diamonds, triangles and ovals. Many of the singers say the shapes make it easier to read and sing the music in four-part harmony. The distinctive sound of sacred harp comes from a cacophony of voices singing rough-edged harmonies with a rugged texture like the walls of an old log cabin. "Finding something that has roots that deep has a lot of appeal," said Buell Cobb, author of "Sacred Harp: A Tradition and Its Music." He added: "This is a living tradition. It's not just a relic." Gerald Godfrey, a retired minister of music who still plays organ at Christ United Methodist Church, said the jarring style of sacred harp sounds like nothing else. "In a typical church choir, the melody's in the soprano," he said. "In sacred harp, tenor takes the melody." Sacred harp never died out in Alabama and has experienced a worldwide renaissance. A group of five people from the United Kingdom sang today in the convention. "People either fall in love with it or don't like it at all," said Rebecca Over, from Surrey, England. "My husband hates this," said Rosalind Oldham of Derby, England. But he paid for the trip to Alabama as a present for her 40th birthday because she's in a choir that sings sacred harp. "It is loud," she said. "There are no bits that are soft. To sit and sing it, I get a great deal of pleasure from that. To stand in the middle and lead a song is amazing. You're hit by a wall of sound." Read more. One choir in Bosnia defies the very notions of hatred, racism and discrimination, being the voice of three nations whose sons and daughters were shooting at each other just 18 years ago. The terror of the Bosnian war is still alive on the streets of Bosnia and Herzegovina, filled with poignant images of bullet holes on the facades of buildings and other structures laid completely to waste. The Sultan Mehmed Fatih Ensemble, whose repertoire consists of Muslim hymns, called ilahis, stands amidst and against this past hatred and atrocity with its members of Croatian, Serb and Bosnian origin. The members are all students at the Ilidza School of Music and each of them stands as a testimony to what tolerance, love, dialogue and brotherhood can achieve. They breathe in the peace the Ottomans brought to Balkan soil, singing ilahis from a united heart, “La ilaha ilAllah”. They don’t care if they are criticized by those who find it hard to understand how a person of Orthodox or Catholic faith can praise the name of Allah and the Prophet Muhammad. Srna Sain, an Orthodox Serb, believes the choir facilitates dialogue. “Our problem is that we don’t talk to each other. This is because we think we’ll never be able to reach a point where we’ll understand each other. I am a Serb and people don’t understand how I can sing ilahi or kaside [odes mostly written for the prophet]. It is normal for me. My family is very understanding. My dad comes to our concerts and he really enjoys them.” Read more. A recent phenomenon in England is the emergence of the Rock Choir. Created in 2005 by director Caroline Redman Lusher, Rock Choir is the first choir to offer a very different experience in contrast to the traditional classical or community choir, pioneering a new approach to singing and entertainment for the general public to experience. Rock Choir Ltd has achieved a reputation in the UK for its sophisticated teaching and leadership techniques, unique style and ethos and most importantly the dynamic and feel-good experiences for its members. Rock Choir is now the largest and most popular contemporary choir in the UK with its members living and rehearsing across Britain and Ireland. It not only supports the community taking part but consistently raises money for charities both locally and nationally through performances and events. Starting Thursday night on ITV is the three part series The Choir That Rocks who should help get more people involved and singing with the choirs. Howard University’s Afro Blue Reunion Choir rehearsed for 18 hours over the span of a few days before joining voices with singer Bobby McFerrin at the Warner Theatre on Saturday night. And McFerrin? He winged it as only he can. Actually, that’s not entirely true. McFerrin knew his role thoroughly, contributing to a series of complex and challenging vocal orchestrations drawn from his recent CD, “VOCAbuLarieS” — tunes that spanned a world of cultural influences. But during this a cappella performance, he sang with such effortlessness and invention that he often appeared to be improvising even when he wasn’t. Under the direction of McFerrin collaborator Roger Treece for this D.C. Jazz Festival performance, the choir deserved all the applause it received for navigating intricately devised vocal arrangements and contrapuntal passages and for fully charging the evening’s most inspirational song, “Messages.” Some two dozen singers strong, the group often generated syncopated or undulating waves of harmonies, then layered and contrasted them for dramatic effect. The longer McFerrin sang, the more interactive the performance became. He invited members of the choir and audience to take turns as his duet partner — a baptism of fire for singers unaccustomed to the spotlight. The volunteers not only managed to rise to the occasion, they triumphed, delighting McFerrin and the audience with their nerve and talent. With the choir behind him, stretching from wing to wing, McFerrin essentially performed in the round. One of the evening’s consistent pleasures was watching the young singers drop their jaws or smile in brilliant unison when McFerrin was engaged in some high-wire daring, either alone or with colleague David Worm. A singer and “vocal percussionist,” Worm matched wits with McFerrin during a freely improvised, bop-to-Brazil-and-beyond interlude. Read more. Acoustix - National Anthem from Allison Westmont on Vimeo. One of my favorite barbershop quartets Acoustix sang The National Anthem for the Thursday night NBA finals. Like they said in the movie The Great Escape, "It's such a simple idea as to be absolutely brilliant." Instead of an a cappella singing group, why not just do a bunch of duets, and see how it goes? Well, in these hands (voices), it works out superbly. Like the Persuasions and Take Six, Doctor and Schumacher have no overdubs nor band, just a creative usage of the human voice through an exhilarating mix of standards, latin and pop on a white knuckler roller coaster ride. Songs like "Honeysuckle Rose" and "I Know That You Know" have the partners exchanging lyrics and rhythm section roles in a way that makes 400 yard relays seem pedestrian. They can create auditory subversive moods as on the Cassavetes sounding "Brandeburg Gate." They do some amazing vocal effects on the funky and foot stomping "Another Bites The Dust" that will have you pounding your fist in the air, while "Temptation" has the two voices open up like a flower opening up to the morning sun. Read more. I really like this recording as is fitting coming from these a cappella luminaries, Angie is a veteran harmony singer in the Bay Area who currently sing with Clockwork, Dan Schumacher (formerly with Kickshaw) now sings with The Bobs and the recording was produced by the one and only Richard "Bob" Greene. Donna Bradley used to have an authoritative teacher’s voice. Now, eight years after being diagnosed with Parkinson’s disease, her voice is so quiet that when she phoned her ex-husband after five years, he didn’t recognize her. “I guess it’s just losing a little bit of yourself,” said Bradley, as she spoke about the effects of the neurodegenerative disease that progressively steals away people’s muscle control, balance and voice. It’s commonly associated with tremors, a shuffling walk, a mask-like face and slow movement. The joy comes a bit easier each week when Bradley, 63, heads to the St. Thomas Moore Health Centre near the Faculte Saint-Jean, where she’s part of a choir filled with members who have Parkinson’s. Anyone with the disease can join — even those who are tone-deaf — because the goal of the choir is to strengthen people’s speaking voices and give them confidence to go to parties and socialize. Merrill Tanner, choir director, singer and speech therapist, began the choir last year as part of a research study to determine if singing exercises can strengthen the voices of people with the disease. “I see too many people with no voice,” said Tanner, who has continued running the choir with about $5,000 from the Parkinson’s Society. “They’re still cognitively intact and they can’t talk.” Some of them live on their own or become socially isolated, embarrassed about their tremors and stutters. Over time, they lose the muscles in their face, throat and stomach. She trains them as she would actors or professional singers, getting them to exercise their abdominal muscles to support deep diaphragm breathing and powerful voices. People in the choir have extensive warm-up routines, stretching their cheeks and lips through exaggerating vowel pronunciations, waving their hips like belly dancers and bending their knees in the Charleston-swing style while singing oohs and ahs. Read more. STOCKHOLM — Quick action by the head of a Canadian choir touring Sweden narrowly averted an accident when the driver of their tour bus suffered a heart attack at full speed, Swedish media reported Monday. About five minutes into the University of Manitoba choir’s journey from Stockholm’s Arlanda airport towards the town of Sundsvall, about 350 kilometres north of the capital, the bus starting swerving uncontrollably on the highway. At that point, choir leader Elroy Friesen noticed the driver had fallen over the wheel, he told the local paper, Sundsvall Tidning. “I threw myself forward and put the gear stick in what I thought was neutral. Then I hit the brakes,” he said. The bus eventually stopped, and none of the 32 passengers were hurt. Passengers then pulled the driver out of the bus, with one choir member performing resuscitation and giving him mouth to mouth. An ambulance arrived shortly after and he survived. “Maybe it’s a gift that I have to react instinctively instead of being passive. I’m surprised that no one was injured and that we did not crash into other cars,” Friesen said. The choir’s tour continued as planned.